and Jeff Searcy who did a 70-day Green Juice Cleanse. Read his inspiring Cleansing Journey here! At the point of contact with Jeff Searcy, he was already 132 days into his Green Juice Cleansing Journey. I could relate with him for wanting to lose weight which was getting out of control, and to go on a plant-based diet after his 70-day juice only fast. As a responsible single father raising four daughters, I salute him for his determination that will set a great example to his children. Although his daughters are not into his healthy lifestyle for now, I just know that they will, eventually. I had the privilege to interview this amazing guy. 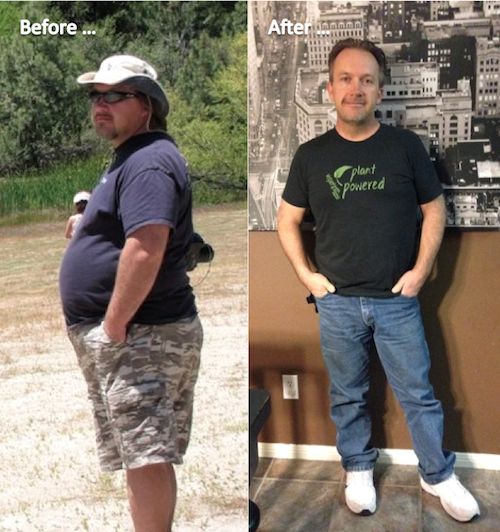 I believe his story will inspire you to take that first step towards improving your own health, through juicing. < <Q: Please introduce yourself, what do you do for a living? My name is Jeff Searcy and I’m 43 years old. I live in the mountain/desert area of Southern California about 2 hours from Los Angeles. I’m a single father raising 4 beautiful daughters. For the last nine years I have owned a Non-Emergency Medical Transportation company with my friend and business partner. Q: Please tell us about your green juice cleanse journey. How did it start and how far do you intend it to go? It seems that every year since my 20’s I put on a little weight. A couple years ago, I found myself hitting 300lbs and was really just disgusted with myself. After trying all the fad diets I would always go back to my old eating habits and the weight would come right back. About a year ago, my cousin Amanda gave me a copy of The China Study. At the time I really wasn’t ready to make a big life change but it planted the seed. In April, within two weeks of each other, one of my best friends since childhood died of a sudden heart attack, and another high school friend died of cancer. That, I think, was the wake-up call I needed. I started reading and researching health and fitness, and watching movies. The first thing I read that really got me in the right mindset was Buddhist Boot Camp by Timber Hawkeye. I started reading The China Study again and watched Forks over Knives, Vegucated, Food Matters, and then Fat Sick and Nearly Dead. The last one was the one that changed everything and introduced me to green juicing. I set out with a goal of doing a 30-day juice only fast. I really didn’t know if I would be able to do it, I have never been one to eat vegetables. I felt that if I was going to stop the junk food and fast food I would have to do a long-term fast. After two weeks, I knew I would make 30 days so I decided to go for 60. Somehow I ended up deciding on a 70-day juice only fast. <Q: Are you only drinking juices or do you also eat solid foods? What other liquids do you drink? Since I finished the 70-day juice only fast, I still have green juice every day. It has become part of my life and I don’t see myself ever not juicing. I maintained a plant-based diet since stopping the juice fast. I really have come to love the taste of vegetables. I’m also trying to avoid salt, oil, and sugar after hearing a talk by Dr. Alan Goldhamer of the TrueNorth Health Center and reading Unprocessed by Chef AJ. I was fortunate to meet both of them in Los Angeles in November and again at New Year New You Health Fest in Marshall Texas. Aside from green juices, I drink lots of water and non-caffeinated herbal tea. I have had a glass of wine a few times. Q: How much juice do you drink a day and how do you space them out? Do you prepare them all ahead of time, or fresh every time? I drink between 80-120 ounces (~2.3 to 3.5 liters) of juice every day. I usually make my juice the night before and put them in glass jars. I take a couple bottles with me in a small lunch box with reusable ice packs. During the fast I drank all throughout the day whenever I felt hungry. Q: What inspired you to start the green juice cleanse? Who were some of your inspiration along the way? I have already talked a little about what inspired me to start my journey. As far as my inspiration, of course my cousin Amanda has been amazing and really keeps me motivated. My friends Brian and Kim, have been there for me every step of the way. Kim adopted a vegan diet after being diagnosed with thyroid cancer. So many others said the right thing at the right time when I needed it. And of course, Joe Cross from Fat Sick and Nearly Dead! Q: Were you facing some personal health issues that you were hoping juicing would help address? I didn’t have any health issues that I knew about; to be honest I hadn’t been to see a doctor for years! I did know it was only a matter of time as my weight got out of control. Q: What were some of the challenges you faced during your journey? Food cravings were really bad in the beginning. Cooking for my daughters was really a challenge and still is. Unfortunately, they learned how to eat from my years of horrible eating. They are not really on board with the juicing or the plant-based diet. Going out with friends was really tough but now it’s not a problem. Q: Are there days that you feel like quitting? If so, can you share with us why? I can honestly say that I never felt like quitting. Once I made my mind up I knew it was a life change I was going to make. I was tempted to cheat and eat a slice of pizza or have a hamburger. Now, that doesn’t even cross my mind. Q: What are some of the physical/emotional changes you experienced and are experiencing? The physical changes have been amazing. I have now lost 72 lbs, went from a 44-inch waist to a 33-inch waist. I’ve pretty much had to buy all new clothes because of the weight loss. That of course led to the emotional changes. I feel like a new person. I can’t really describe the emotions that I feel every day. I have energy all day and just feel more confident in everything I do. Q: What were the reactions of your family members and friends when they heard about your green juice cleanse? Are they supportive of what you’re doing? Initially there was very little support from most of my friends. Of course some thought it was just a fad diet. Close friends and family members that knew how I have always eaten figured I wouldn’t last a day. Once I started getting results the attitudes started to change. Now, there are at least five of my friends who have started juicing and many more have asked for my help. As I never seem to stop talking about juicing and plant-based diets, I have friends I haven’t heard from in years wanting to know what I’m doing. Q: How do you handle lunch/dinner/party invites during your Green Juicing Journey? So far it hasn’t been a problem. I’ve met friends for lunch or dinner at places that I know have vegan selections on the menu or I will just get a salad. Q: What was your feeling at the end of your 70-day juice fast? It really came fast, much faster than I expected. To be honest I never thought I would have the level success that I have. But I am more motivated than ever to continue on my path. Q: What are your plans beyond this journey? When is the “end” of the Journey? I don’t really see an end to my journey. I have really come to enjoy talking about juicing to anyone that will listen. I have been blogging and going on juicing message boards to share my story and give advice. Q: What juicer/blender do you use and why? I use a Breville Elite 800JEXL. I really didn’t know anything about juicers so I just ordered the one that Joe Cross used in the movie. I have since tried a couple other juicers including an Omega and a Champion. Both were good juicers but I really like my Breville. Less prep time and less juicing time is a big plus for me. I’m looking forward to trying the new Kuvings Wide Mouth Slow Juicer when it’s available in the USA. Q: Can you please describe the program that you follow, if any? I didn’t really follow any set program. I experimented with several juices before I started the fast. In the beginning I really just made juice and drank when I was hungry. Some days I wouldn’t drink enough juice or water and would get dehydrated pretty quick. Q: Please share with us briefly what a typical day would be on a “busy” juice-feasting day? Since I make the juice the night before, when I leave for work I fill up a 28oz cup that I reuse. I don’t just drink it all down but instead sip on while driving to work. I would refill the cup a couple times throughout the day until I got home. While making dinner for the girls I would also be prepping veggies for the next juice. Q: What were some of the common/favorite ingredients you use during your juice fast? Do you use only organic? Please share one of your favorite green juice recipes. All of my juices have the same basic fruits and veggies: Romaine lettuce, cucumbers, carrots, celery, apples, and lemons. Along with those I always use kale, spinach, or chard, whichever one I have. I will also add cilantro, watermelon, grapes, strawberries, beets, red or yellow peppers. I get organic when I can. During the fast, I was using so much produce I just couldn’t afford to go all organic. Now that I’m eating as well and not juicing near as much juice every day I use much more organic. My favorite juice is: 3 heads of Romaine lettuce, 2 bundles of kale, 6 carrots, 6 celery, 3 cucumbers, 1 beet root, 2 granny smith apples, 1 lemon, handful of cilantro, handful of watermelon chunks, and 1-inch piece of ginger root. That makes just under 1 gallon (~3.7 liters) using my Breville. Q: Please share how you are planning to break this juice fast? I ended up doing a 70-day juice only fast. No real reason why I picked 70, it just ended up that way. I really think I could have gone longer if I wanted to. By then it had become such a habit and I no longer had craving for junk food or any solid food. Absolutely! I don’t know if everyone could or would want to go 70 days but I think most people are capable of doing 15 or even 30 days. In my case, the desire to get healthy was much stronger than my desire to eat and break the fast. Q: What is your best advice for anyone intending to do an extended juice fast/feast like this? I really think everyone would benefit from juicing every day. And everyone would certainly benefit from a fast to rid their body of toxins and jump start a healthy lifestyle. I have been getting quite a bit of emails asking for advice on where to start. It really depends on what your goals are and where you are currently at with your health and eating habits. I tell them to not try and jump in without preparing. Take a week to 10 days and juice every day in addition to eating. During this time, wean off caffeine so you don’t go into withdrawal when you start the fast. Also, you need to have a plan for when you want to finish your fast. I have come across many who have done a fast and talked about how great they felt. After the fast they go right back to eating all the unhealthy foods they used to eat. For me, I felt I had to go all plant-based or vegan. If when I finished my fast I had one cheeseburger, I would justify having something unhealthy the next day as well. Pretty soon I would be back to eating the same junk I used to. I made the decision to go plant-based and haven’t regretted it.